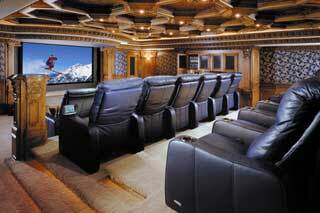 Having comfortable home cinema seating is almost as important as the quality of the sound and picture. After all, for a long movie, you may be sitting there for a few hours, and with a Cinematech seat you will still be snug and comfortable at the end of the movie. 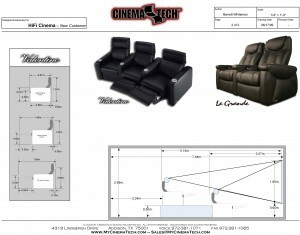 We primarily use Cinematech Seating, as being one of the world’s best. They have superb comfort and are adjustable to allow you to find the most comfortable sitting angle to help you get the best of the movie experience. Prices from around £1260.00 (single M3 seat) plus delivery charge. There are two primary types of mechanism for the CinemaTech seats: Incline and Recline. 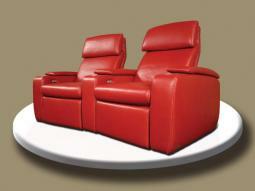 The Recline Mechanism moves the seat back rearwards and then brings up the foot support. The Incline mechanism however slides the seat pan forwards whilst moving the seat back down. In this way the seat can be positioned close to a rear wall and still operate. With very solidly built mechanisms they will give you years of trouble-free comfortable use. 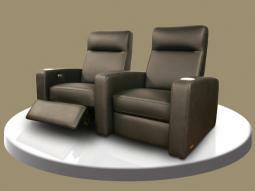 All new in 2014, a wide range of sectional seating for the more “casual” home cinema experience. Also new in 2014, standard black leather M3 seats are now available on short lead times in the UK and prices from only £1260 per seat (plus delivery charge of £189). 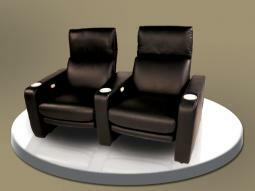 These are based on the Mezzanine seat and come in straight rows or single seats in black leather only. 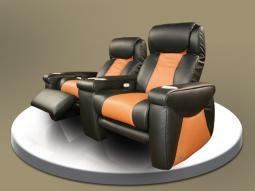 Now you can own the luxury of the best cinema seats on the market without breaking the bank ! Call for more details. 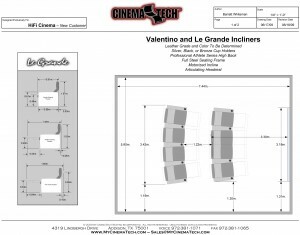 Below is an example of Cinematech seating design with dimensions etc.